Figure 6-6. Dimensions of LARC V and LARC XV. Figure 6-7. OCEI Pengo puller-tensioner winch. Environmental factors at the cable installation site may dictate the need for cable protection. Protection is usually provided to prevent impact and abrasion damage and to stabilize the cable against movement from the forces generated by wave and current action. Protection and stabilization techniques are separated into four general categories: mass anchor, tiedowns, burial, and tensioning. 6.2.2.1 Mass Anchor. 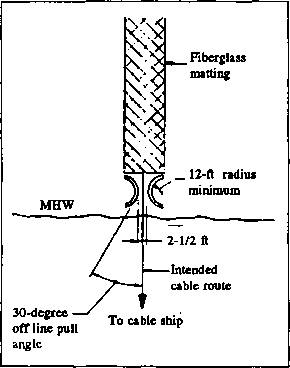 Mass anchor stabilization techniques, by virtue of their weight and the resulting friction between the seafloor and the system components, allow the cable to resist environmental hazards. The techniques discussed in this section include: split-pipe, concrete, chain, and oil field pipe. • It provides abrasion protection for the cable. • It increases the cable system density, reducing the system's sensitivity to hydro-dynamic forces. Split-pipe is available in 36-inch-long sections of both 3-1/2-inch ID and 5-inch ID; a 3-1/2-inch-ID pipe half section weighs 75 pounds dry and 64 pounds in water. A 5-inch-ID pipe half section weighs 97 to 102 pounds dry and 85 to 88 pounds in water. Bolted together, half sections of split-pipe produce a ball-in-socket connection arrangement, with an assembled length of 36 inches per set of half sections. Split-pipe in 5-inch-ID can be used for covering spliced sections of cable. Each ball-in-socket connection allows a 12- to 15-degree bend between sections, which results in a 12-foot minimum turning radius. Figure 6-9. Split-pipe protection system. A section of split-pipe uses eight fasteners, the most common being a 5/8-inch stainless steel bolt, lock washer, and nut assembly. The two fasteners closest to the bell end of the split-pipe provide the strength at the ball-in-socket connection. The remaining fasteners supply additional clamping strength. (a) Applying the split-pipe to the cable by divers with the cable resting on the sea-floor. (b) Applying the split-pipe to the cable on the beach and then dragging the piped cable to sea. (c) Applying the split-pipe to a floating cable from an underrunning vessel. a. Diver Split-Pipe Installation. The major advantage of diver-applied split-pipe is its simplicity; it does not require sophisticated equipment or a significant amount of coordination with other activities. The technique becomes increasingly difficult as sea conditions become more inhospitable and is only recommended when the application of split-pipe on the surface is not feasible. Best results are usually obtained by staging the split-pipe along the cable route next to the cable before deploying divers. This can be done using surface- or diver-controlled lifting devices, as discussed in Section 2.5. Fasteners and tools should be carried by the divers to the work site. On sandy bottoms, only the split-pipe to be installed that day should be staged to reduce the chance of sand transport burying the sections. Some success has been obtained by placing a 1- to 2-foot-diameter cable reel under the cable or by attaching diver-controlled lift bags to lift the cable off the seabed to make application easier. This technique requires litde more than the appropriate fastener tools, divers, and the necessary diving/support equipment. A major disadvantage is that considerable diver time is required. b. Beach Split-Pipe Installation. Onshore-applied split-pipe calls for landing the shore end of a cable in a normal manner, except that additional cable is pulled ashore. The length of additional cable is equal to the amount of split-pipe protection to be applied. This method is usually practical only if the length of cable to be stabilized with split-pipe is less than about 500 feet. The split-pipe is applied on the beach and the cable ship pulls the cable back out to sea. Uponinhauling the beach end, the cable should be secured to a deadman anchor with a cable stopper directly in line with the incoming cable to minimize cable movement if seaward forces are applied. A quick-release device between the cable stopper and the deadman is used to facilitate release for outhaul. A matting material, typically fiberglass, should be preplaced under the application area to reduce friction between the cable and the beach. This matting, in conjunction with the beach guide, as illustrated in Figure 6-10, allows a smooth transition over the beach into the water. Hauling forces can be reduced by attaching float balloons to the pipe-enclosed cable. The beach-applied technique is a good approach for handling split-pipe installation through a heavy surf zone, particularly when surf conditions are seldom less than 3 feet. It does have a few drawbacks, however. Hauling split-piped cable back out to sea requires the cable ship to stay on site longer than normal, restricting its use elsewhere. Enough room must be available to allow the inhauling of additional cable and to allow straight-line split-pipe application on the beach. c. Underrunning Vessel Split-Pipe Installation. Using an underrunning vessel is generally the best technique for applying long distances of split-pipe. 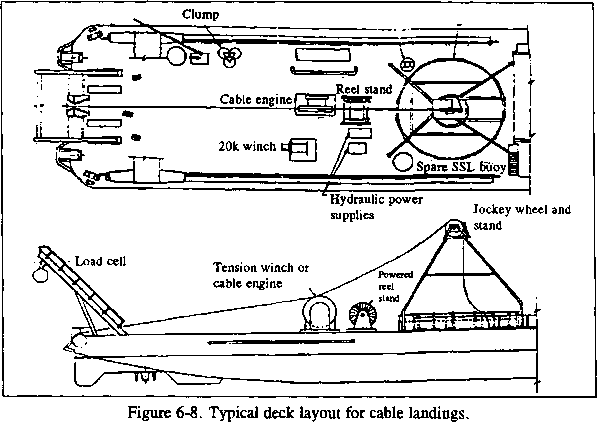 An adequate vessel, such as an LCM-6 or the modular construction platform (Appendix B), with an underrunning system installed onboard, is required. Weather conditions must be sufficiently favorable to allow a vessel to remain moored in the application area for long periods of time. 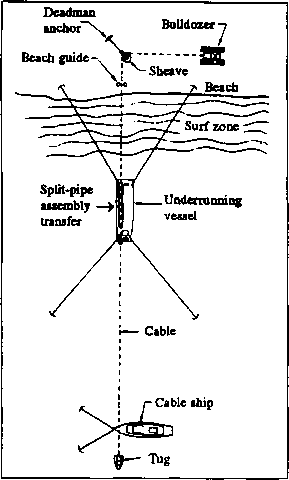 In addition, the time required to land the cable must be extended long enough to allow application of split-pipe in the surf zone. This technique, illustrated in Figure 6-11, is applicable for installations requiring more pipe than can be accommodated using the onshore-applied method. Figure 6-10.Beach configuration for shore-applied, split-pipe installation. 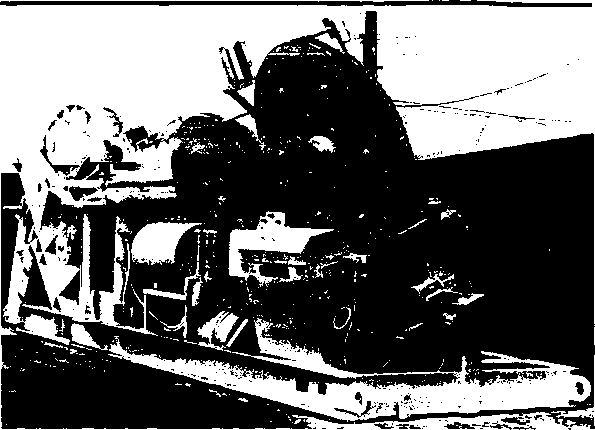 Figure 6-11 Equipment for underrunning vessel technique of applying split-pipe. cable, and split-pipe is applied as discussed above until the cable is ready for bottoming. Sacked concrete consists of many types of flexible containers, such as burlap, nylon, canvas, or rubber bags, filled with concrete on the surface and positioned over the cable on the seabed. Cast-in-place concrete consists of large masses of concrete delivered to the seabed as a wet mix and either allowed to flow unconfined over the cable or pumped into flexible forms that have been placed over the cable. Precast concrete elements are blocks of concrete that have been poured and cured on land before positioning over the cable on the seabed. Underwater concreting techniques are discussed in Section 2.10. • Chain - Chain is an appropriate stabilization technique for cable runs with limited life requirements and for stabilizing many cables in a confined area. Chain can be draped across and firmly attached to the cable, laid alongside and attached to the cable, or stretched between large anchors to provide a restraint base for multiple cables. 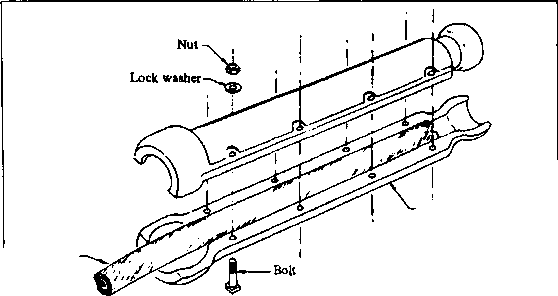 The underwater handling of chain is accomplished using the techniques discussed in Section 2.5. • Oil Field Pipe - The primary protective function of oil field pipe is to provide rigidity to underwater cable to lessen cable abrasion by wave and current action. 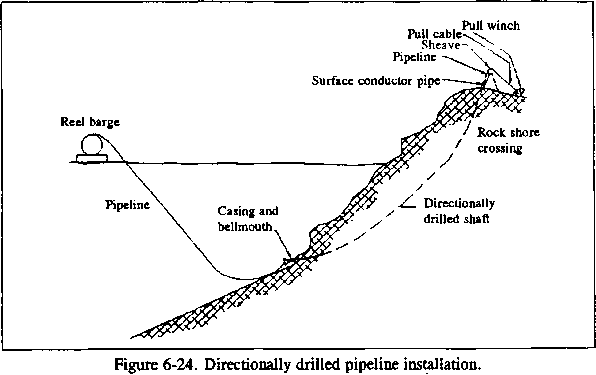 The use of oil field pipe will decrease the cable system density, requiring the pipe to be immobilized by other techniques. Oil field pipe is a tough pipe that resembles standard pipe and comes in about 20-foot lengths. To facilitate assembly, a pipe assembly machine is used to assemble the desired length of pipe, through which the cable to be protected is run. A protective medium can be placed inside the pipe for additional corrosion protection, or grout can be pumped in to increase the in-water weight. 6.2.2.2 Tiedowns. The use of tiedowns is an immobilization technique that physically couples the cable to the seafloor along the length of the cable. This type of protection technique is generally used when the cable or cable/mass anchor system is not heavy enough to remain in place under wave and current action. Tiedown techniques include: screw anchors, grouted fasteners, and rockbolts. • Screw Anchors - Screw/auger anchors, used in sand and clay seabeds to stabilize cables, work on an auger principle. They consist of a rod with a disk that is shaped in the form of a screw. The auger is secured to the cable by either a strap encircling the cable with the auger attached or by installation in pairs with a U-shaped strap straddling the cable, as illustrated in Figure 6-12. Auger anchors are usually embedded with an installation unit consisting of a buoyancy package, a torque motor (either pneumatically or hydraulically operated from the surface), and a framework to hold the components and provide the reaction torque necessary for installation. Commercially available installation units typically weigh about 6,000 pounds, requiring surface-supported lifting capability. Other anchors are discussed in Section 2.8.